1 – Trophy can’t be won by same person in consecutive years. 2 – Claim for points must be done within 2 weeks of participation in event to enable administrator to keep leader board up to date. 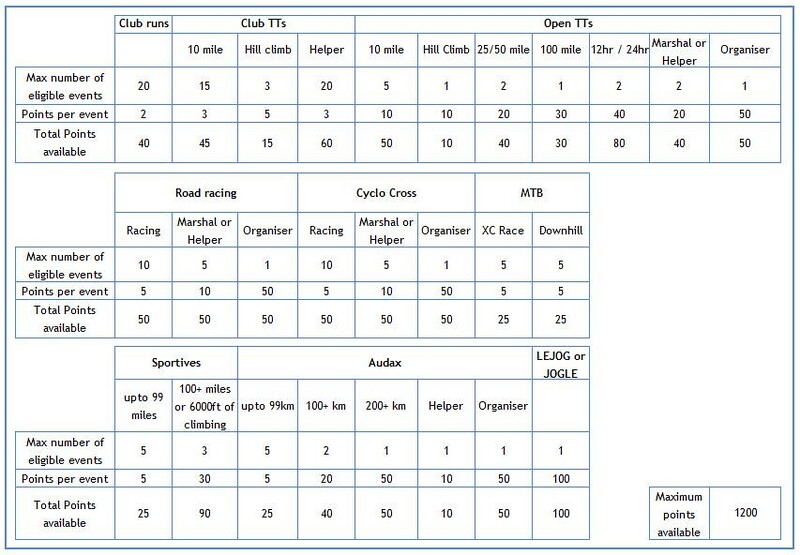 3 – Official event mileage/elevation to count for Sportive / Audax, not personal stats from computer / GPS device. 4 – Helper: Timekeeper, Pusher, Number Seller /taker, Photographer, only one role claim per event. 5 – Clubrun points scoring clarification: Starting at the Broadways in an organised group and making it to at least the cafe, including stopping. Solstice ride counts as extra clubrun. In 2015, points were considered for events participated in between 29th March and 26th December. From 2016 onwards, points will be calculated from 1st Jan until 26th December.